Chung Hwa Pulp Corporation (CHP) is a leading Taiwanese paper manufacturing company. 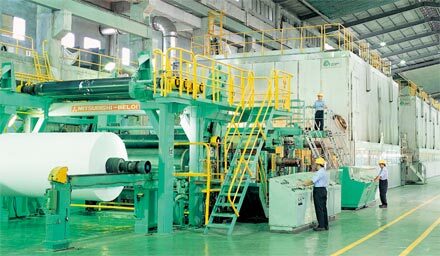 CHP's pulp and paper mill in Hualien has two paper machines. Machine #1 produces 200 tons per day of fine paper that is 3,750 mm wide and has a basis weight of 40-120 g/m2 and a 5% moisture profile. Production is now full automated at this plant by a third generation quality control system (QCS), the Yokogawa B/M9000CS. This replaces a Honeywell QCS that had been installed in 1990 and which had been a replacement for the original Yokogawa B/M System dating back to 1981. Work to install the QCS together with the actuators and production control system was successfully completed by Yokogawa in 2006. The project was completed on schedule and within budget. The major objective for this upgrade of machine #1's control systems was to improve paper quality. The previous systems relied on a machine direction control strategy that was based on basis weight and moisture control. With Yokogawa's B/M9000CS quality control system, the latest control functions including basis weight consistency profile control, caliper profile control, and moisture profile control with high resolution sampling and display have been introduced. Cross direction (CD) adaptive control has enabled automatic tuning using artificial intelligence techniques. A virtual actuator zone averaging method has improved CD control. And a finite time setting response method has realized stable and high speed control. The development of these functions relied on Yokogawa's years of experience with paper manufacturing technology. As a result of these improved functions, a 30% improvement in paper quality and a 10% increase in machine speed have been achieved. The CD moisture control has reduced steam consumption by 30%. Before this revamping project, the steam header pressure was always around 3 kg/cm², but now it stays around 2.7 kg/cm². CD profile control has improved paper fiber orientation. And the use of a fiber orientation sensor for online monitoring has improved paper quality by decreasing the likelihood of sheet breaks on the rotary press, improving printing displacement in multi-color printing, and reducing curling defects that can cause paper jams in photocopiers. The CENTUM CS 3000 system that controls the stock preparation, additive, and screening processes is integrated with the QCS and various actuators through a plant-wide Ethernet network. This allows operation to monitor and control the entire paper making process from a central control room (CCR), ensuring a quick and agile response to changing conditions. All human machine interface (HMI) terminals are located in the CCR, and there are a number of PCs at the company's main office that are used for maintenance and engineering purposes and are linked with the system by fiber optic cable. Engineers are able to monitor operations and perform modifications at any time from the office. "Our project members, Yokogawa's project members, and other members from partner companies worked as one team to complete the project. Paper machine #1 has been operating more than two years and is producing high quality fine paper. The quality control system upgrade and the integration of the entire process control system has brought huge benefits to us. 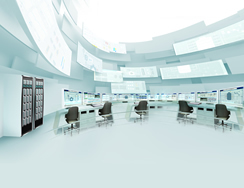 We really appreciate Yokogawa's highly reliable systems and great cooperation."